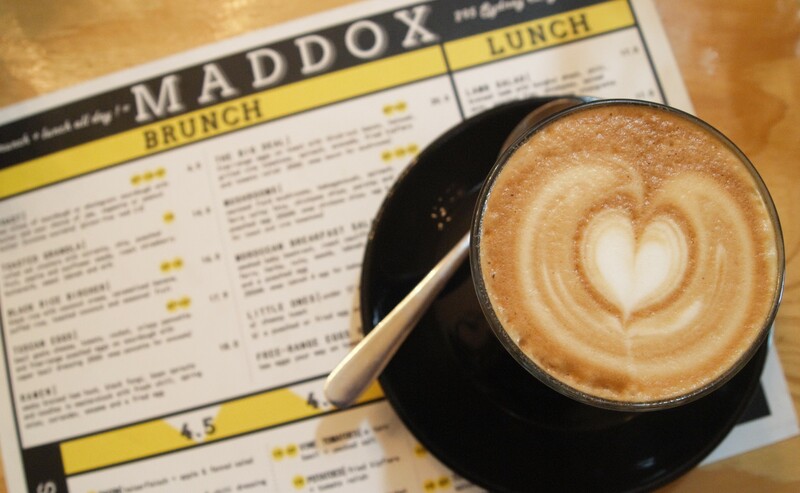 Located on Sydney Road, Maddox is an understated little café housed in one of the pretty old shopfronts that line this busy street. The leadlight front windows are in stark contrast to the exposed brick interior which is styled with recycled timber and industrial pendant lights. 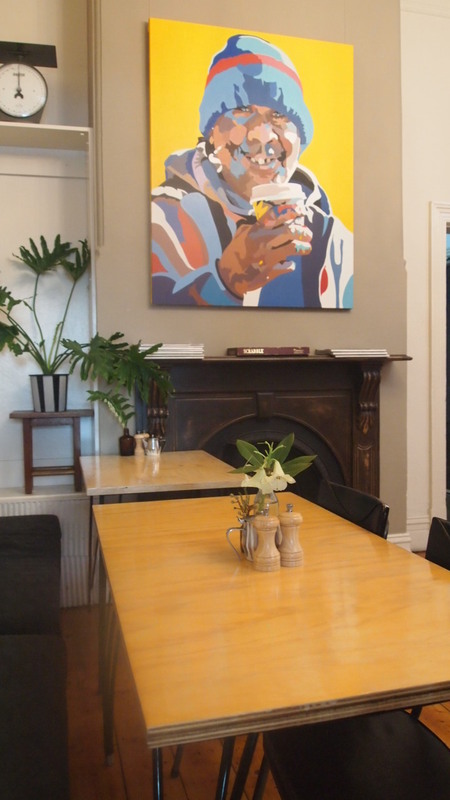 Walking past the timber counter, we took a seat in the charming backroom, which was a more refined space than the entrance, with a large restored timber staircase, open fire place and some really eye catching artwork furnishing the walls. 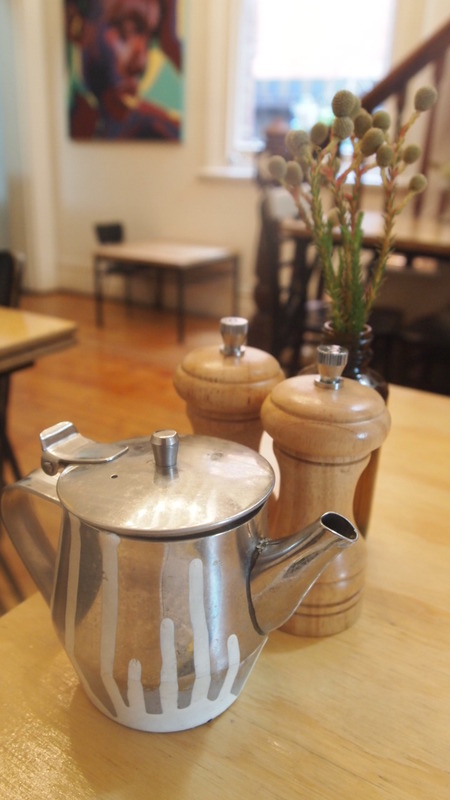 Having heard great things about their hotcakes, we came with a predetermined idea of what we were going to eat, however to our disappointment, we were advised that they had sold out for the day. I was a bit surprised, given it was only 1.30pm on a Saturday and I’d be lying if I said I wasn’t disappointed. This threw a spanner in the works as I really had my heart set on a sweet treat. In the end I opted the son in law eggs which were fried and served with a mixed herb salad and some roti bread. For the most part I quite enjoyed this dish. The eggs were only lightly fried, so there weren’t any crispy bits, but they were seasoned well and surprisingly worked really well with the roti. 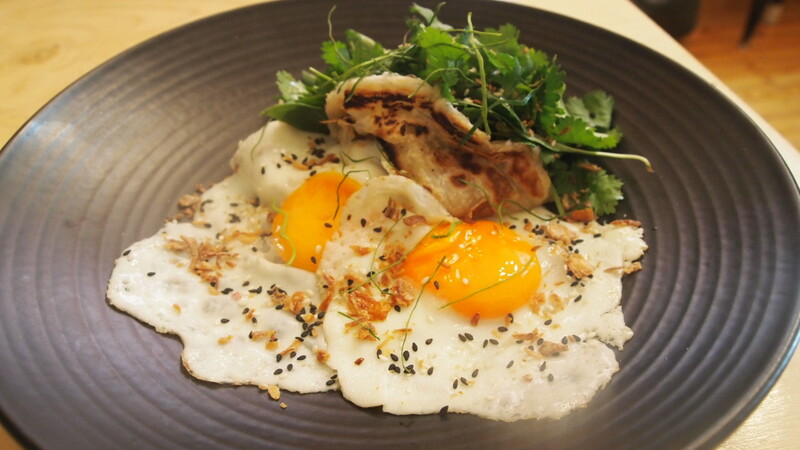 The herb salad was quite refreshing, with the stand out being the thai basil – paired with some egg and roti, it was delicious! 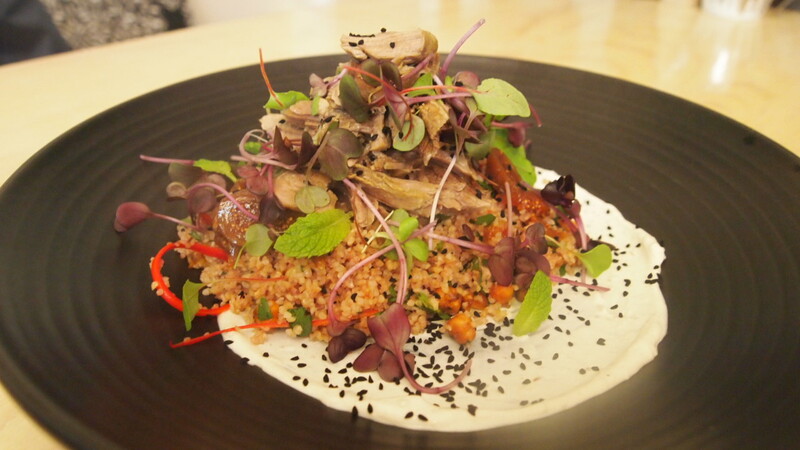 Influenced by traditional middle eastern flavours, the lamb salad was quite a simple dish. The pieces of braised lamb were served on a bed of lightly seasoned burghul wheat with poached fig and chickpeas mixed through it. Overall it was nice, but I couldn’t help but feel that it was missing something. The only thing I can put my finger on is that the burghul didn’t have a great deal of flavour, it really needed to be seasoned with something a bit punchier to provide some additional depth. For those travelling with children, this may not be the ideal place for a relaxing lunch or brunch. The back dining room is really charming, however it has a large staircase which hasn’t been closed off, which is pretty much like dangling a lolly in front of a child eyes, they won’t be able to stay away from it. I couldn’t pull my 18 month old son away from it, so I spent most of our lunch standing by the stairs. Why didn’t you just put him in a highchair you ask? Well, that would be because I wasn’t offered one. When we arrived, I clearly had a small child on my hip, however not even once was I asked if I needed a highchair, so I just assumed that they didn’t have any. And yes, you should never assume anything, so I should have asked, but sometimes you’d just hope that common sense would prevail and someone would have said, oh you have a small child, would you like a highchair? Lets just say, I was super annoyed at the end of our visit when I saw a highchair tucked around the corner, both at myself for not asking and at the staff for not offering. 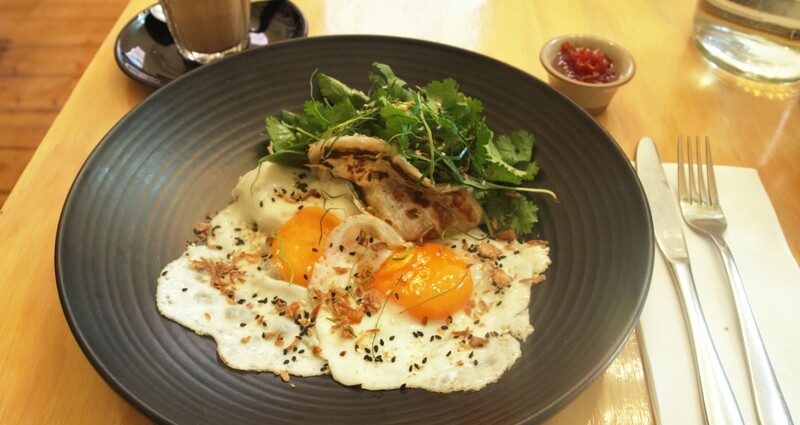 Those egg yolks look perfect!